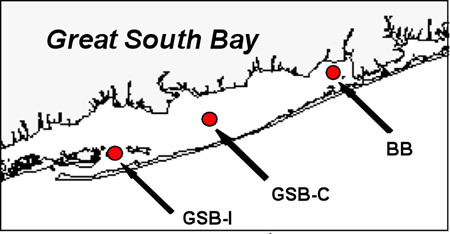 We are generating generating model-ready data on the temporal and spatial dynamics and distributions of phytoplankton and nutrients in Great South Bay. New sampling has been performed weekly-to-biweekly in spring and summer, and biweekly-to-monthly in fall across three sites. Organic and inorganic nutrients (nitrate, nitrite, ammonium, orthophosphate, dissolved silicate) and dissolved organic nitrogen analyzed spectrophotometrically. 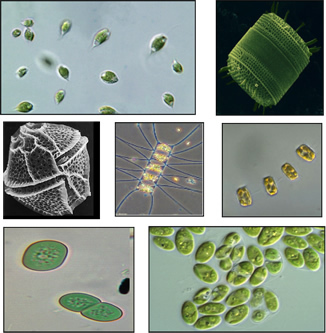 Phytoplankton community composition and abundance evaluated via size fractionated chlorophyll a (whole, <5µm, <2µm), microscopic identification and enumeration, flow cytometric quantification of eukaryotic and prokaryotic plankton, HPLC analysis of 25 different phytoplankton pigments, and flow cytometric determination of brown tide densities. We are also utilizing 35 years of water quality monitoring data collected by the Suffolk County Department of Health Services. This data set consists of monthly-to-weekly surface water samples from 20 stations analyzed for three groups of phytoplankton: 1. Large phytoplankton, > 10µm; 2. Non-brown tide, small phytoplankton, <10µm; and 3. Brown tide cell densities. Suffolk County data also provides dissolved inorganic and organic nitrogen concentrations. We have also performed dilution experiments to quantify spatially explicit intrinsic cellular growth rates and microzooplankton grazing rates on the three classes of phytoplankton described above. These data will create a robust foundation for the functioning of the lower trophic level model.